You can serve this on a platter with a bowl of very warm water, where people build their own, or you can make them ahead and keep them in the fridge. To make, dunk a rice sheet into the very warm water, and turn, wetting the edges. Once the sheet starts to feel pliable, lay it on a clean surface and add your desired ingredients. The rice paper is transparent, so I lay my shrimp down first (usually 3 in a row), and then put my other ingredients on top. Finish with a drizzle of Sriracha, and roll up like a burrito (fold right and left edges over, then the top one, and then roll towards yourself). Set aside on a platter, and finish the rest. 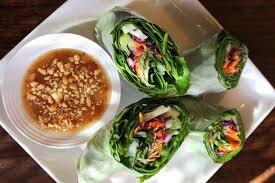 Serve with Homemade Peanut Sauce. Blend everything together in a food processor until desired consistency.